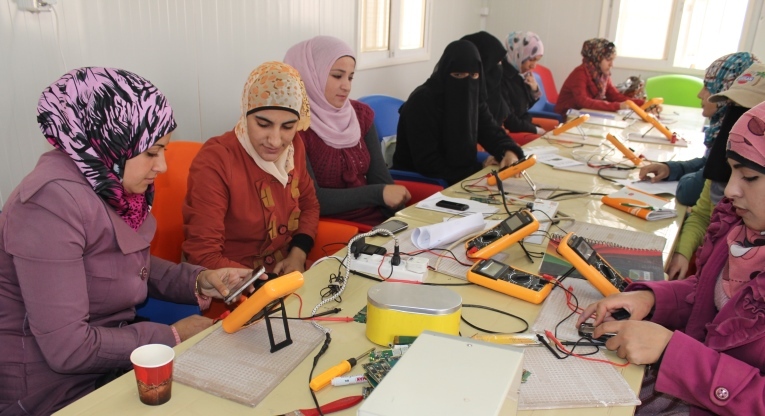 Syrian refugee women learning to fix mobile phones. Finn Church Aid with Amman Academy are training 30 young Syrian refugees to repair mobile phones at Za’atri refugee camp in northern Jordan. The youth suggested a mobile phone repair course because they believe it will provide them with relevant skills to earn a living and many are now planning to set-up their own mobile phone repair shop. 23-year-old Wafaa Hariri, 20-year-old Basel Ahmed and 20-year-old Basel Noserat plan to do just that. “We can start up a business and make money out of this”, says Hariri. Ahmed explains that he had anxiously waited for the course, which was originally scheduled to begin in May. “Me and my friend, who also is on this course, we are planning to start a business. Yesterday we bought a laptop and the teacher is helping us to download software,” he says. “Back home in Syria, I was studying Arabic. If we go back even five years from now, we cannot go back to study. We need skills that allow us to stand on our own feet and earn money”, Ahmed adds. Noserat has now been able to use his new skills in practice to fix his friends’ cellulars. A mobile phone is an important device. Most of the refugees in Za’atri have at least one phone. Mobile phones can be purchased in Za’atri, but so far phones that need repair have been sent outside the camp to be fixed. The youngsters attend mobile phone maintenance classes three times a week over a period of seven weeks. At the end of the course they will receive a certificate, which will be useful when applying for jobs or setting up a business. Half-way through the course, the students mentioned they had gone through different mobile phone brands’ operating systems and were now focusing on the device itself. They all said the course had been interesting and that the teachers patiently explained anything if they did not understand. Noserat assures that he would not be startled if somebody asked him to fix their new smartphone. “The more advanced it is, the easier it is to maintain. The basic structure is similar, “he explains. 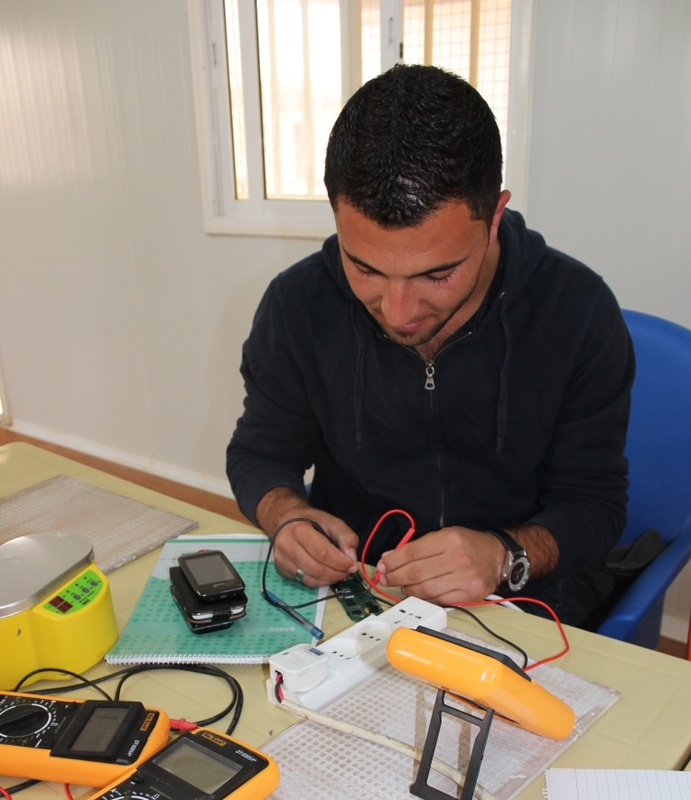 The first mobile phone maintenance course at Za’atri however, may also be the last, because the cost per student is around 250 euros due to teaching and a lot of necessary equipment. Basel Noserat learns to repair mobile phone at Za’atri refugee camp in Northern Jordan.